You are hereClay Claiborne on the Daily Kos / On Libya & Glenn Greenwald: Are the anti-interventionists becoming counter-revolutionaries? I think Glenn Greenwald has always harbored certain illusions about Qaddafi. That is why all last year as thousands of Libyans were fighting and dying to overthrow the Qaddafi regime, he generally spoke of regime change as something to oppose. As Bill Weinberg wrote:This touches on a deeper contradiction in Greenwald's (and the left's) general position on Libya. From his opening paragraph, Greenwald writes as if "regime change" in Libya would be a bad thing. Entirely apart from whether "we" (what's with this use of the first-person plural to describe the US government?) have the moral credibility to bring it about, Libyans are fighting and dying for "regime change" at the moment, and Greenwald might want to offer them some encouragement, rather than implicitly loaning comfort to the dictator by dissing "regime change." And what makes it particularly tricky is that (as previously noted) there is clear rank-and-file support from the rebels—and the populace of Bengahzi, at the very least—for military intervention (see AlJazeera, March 18; SMH, March 11). Whatever US motives may be, the bombardment does seem to have saved Benghazi from a general slaughter back in March—or at least that is how it is pretty evidently and universally perceived on the ground in eastern Libya.Clearly, Greenwald is only concerned with US motives and while he makes a strong case that Obama's actions were illegal sans congressional approval, if he could have had his way, Benghazi and Misrata would have suffered a fate similar to many Syria cities today while the world watches what a dictator can do to his people with tanks, aircraft and artillery that aren't effectively opposed. Like just about everyone else on the left that opposed NATO intervention in the Libyan war, his point-of-view is not that of a Libyan or even what's best for Libya, his point of view is that of an American anti-imperialist that puts the US at the center of everything. Like Carl Davidson of CCDS, and many others in the anti-interventionist camp, he saw the NATO war against Libya as a remake of the Iraq War and so many other imperial adventures. Writing about the Libyan revolution right after the liberation of Tripoli, he hearkened back to "the very first time I wrote about a possible war in Libya" and links to a piece written on March 19, 2011. By stating this he reveals two things: 1) He didn't write about the civil war in Libya until after NATO got involved, and 2) as late as August, he was not willing to acknowledge that a war was already in progress before NATO got involved. He didn't follow the opposition before they won NATO support, so to him they will forever remain the "NATO-backed" rebels. The tag is meant to be an attack on the revolution against Qaddafi and those Libyans who made it. Even in his most recent piece on Libya, he speaks of Libya and Iraq as parallel situations:Obviously, the Gadaffi and Saddam regimes were horrible human rights abusers. But the point is that one cannot celebrate a human rights success based merely on the invasion and overthrow of a bad regime; it is necessary to know what one has replaced them with.Actually I think one can and should celebrate the ending of any abusive relationship even if it is unclear what the future may bring. To hear Greenwald tell it, the Libya's shouldn't have overthrown a murderous tyrant and his police state unless they knew, for sure, that everything would be peachy-keen afterwards. Except he doesn't think it was the Libyans, who lost thousands of brave thuwar in the war and suffered many hardships to defeat Quaddafi. It was the NATO invaders, who flew a few thousand "strike soties", dropped ordinance on less than half of them, and lost no lives, that beat Qaddafi. He writes:NATO succeeded in defeating the Mighty Libyan ArmyClearly the US invaded Iraq, they had hundred's of thousands of soldiers there for many years. Just what Greenwald considers the "invasion" of Libya not very clear unless he is referring to the invasion of Libyan air space. What is clear is that for him, in both cases the same actor, namely NATO, or the US, is the force behind the overthrow of both regimes. The revolutionary struggle of the Libya people play no role in his narrative, and even when he refers to "those who are the loudest advocates for these wars," he links to a NYTimes article by A.M. Slaughter. Well, the Libyan opposition was loudly advocating international support for their war, more than a month before Greenwald started writing about it, but he wasn't listening. Like most in the anti-interventionist camp, Greewald probably thought that the air strikes were just a prelude to the NATO "boots on the ground" he was sure would be necessary to finish the job. Well, the Marines never landed on the shores of Tripoli this go round, but that won't stop the anti-interventionists from insisting that not only were they secretly there, but they were actually responsible for running the whole show. The Libyans were just pawns in their game. They believed Qaddafi when he said they had captured 17 foreign special forces in Sirte, including a number of Frenchmen and Brits, video to follow. It never came. They believed the British PM when he sought to claimed credit for the Libyan victory. Although they never comment on SAS operations and offered no proof in this case, he was believed by the anti-interventionists because that is what they wanted to hear. In January, Cynthia McKinney announced that 12,000 US troops were in Malta and about to descend on Libya. It never happened. This Monday, Mahmoud Jabril gave an interview in Benghazi and said categorically:"we never had any foreign advisors.."The anti-interventionists require no proof to brand him a lying Arab because what he said doesn't fit their narrative. They prefer to believe PM Cameron and the "Lawrence of Arabia" mythology about the Libya revolution. For them it was really the Rambo types that beat Qaddafi so that western oil interests could triumph, the Libya opposition, those that aren't paid agents, are just dupes. The problem with this mythology is that Libya is a free country now. Anyone can go pretty much where they please, hundred of newspapers have sprung up, the Internet is not shut down, and a great many Libya's are strongly opposed to any foreign attempts to hijack their revolution. Remember when, early in the war, the Brits try to send in an SAS team to make contact and the thuwar arrested them? So it is very hard to believe a handful of western 'advisors' are really running the show and no Libyans are loudly complaining. Although nobody but Cynthia McKinney is claiming that thousands of US troops are in or heading for Libya, I find it amazing the levels to which the anti-interventions will sink to "prove" that their predictions of NATO "boots on the ground" have come to pass after all. They simply can't bring themselves to say they were wrong. While most fall back on the secret special forces theory, one commentator argued it this way:Yes, we don't have any infantry in Benghazi. But we did have US Pilots crash landing in Libya, and their boots were indeed on the ground. Is that what Greenwald was talking about when he talks about "invasion?" Is he one of those guys? Since Libyan victory, Greenwald has taken the tact of reporting only negative developments from Libya and warning of dire consequents to follow because Qaddafi was overthrown:There is nothing noble about invading and bombing a country into regime change if what one ushers in is mass instability along with tyranny and abuse by a different regime: typically one that is much more sympathetic to the invading regime-changers.You see, in Greenwald's narrative, the Libyan regime changers are the invaders, namely NATO. So what are the Libyan revolutionaries? Chopped liver? And the NTC puppets of NATO, pure and simple? What is the MSM saying? Lately we have seen a flurry of articles on Libya from the main stream media that the anti-interventionist will find delightful reading because they support their counter-revolutionary position. Take, for example Derek Henry Flood's recent article in Asia Times, Arab Spring bleeds deeper into Africa, in which he blames the Libyan revolution for the current troubles in Mali, except like other anti-interventionists, he thinks NATO is the real force behind events. You know those Qaddafi mercenaries from sub-Saharan Africa that the thuwar complained about and the anti-interventionists insisted didn't exist? Well, now that they have been defeated, forced out of Libya and returned to Mali flush with Russian weapons supplied by Qaddafi, Flood puts the blame for what is now happening in Mali of those that put an end to their killing in Libya. Flood excuses the earlier denials of African mercenary involvement, saying:the place of sub-Saharan Africans in the Libyan war seemed more propaganda than fact at many points because of the rebel claims were most often impossible to independently verify. They seemed more "propaganda than fact" earlier, because they didn't fit the anti-interventionist narrative. Then he goes on to accuse the NTC of mental illness because their reality was different from his beliefs:The NTC ran a schizophrenic propaganda campaign emphasizing their fight as a colorblind one that did observably entail Libyans of all hues while constantly denouncing, in terms that seemed to stray into racism at certain points, their enemies’ exploitation of African soldiers.Then he goes on to blame the revolution for the troubles in Mali:Weapons, material and men move easily across porous borders, poorly thought out regime-change scenarios are imposed from outside, and assorted strong men fall throughout the developing world. Colonel Gaddafi did have foreign nationals fighting alongside his troops to be sure, but their role in the war is far from clearly understood. Understood by who? Would that be as understood by Derek Henry Flood? As understood by the by "the left"? Or as understood by the Libyan revolutionaries which as he correctly pointed out "that did observably entail Libyans of all hues? "Gaddafi deftly positioned himself as the solution to many of Africa’s persistently unstable regions whilst often stoking these very same disputes with arms and boilerplate rhetoric about perennial Third World revolution.Because Qaddafi had a record of "stoking.. disputes" and also pumping arms into them based on some sham ideology, he most certainly was not what he claimed to be, in fact, I would say that he had an abusive relationship with Africa.Libya’s North Atlantic Treaty Organization and Gulf Cooperation Council-backed revolution threatens to destroy or at least bifurcate the wobbly Republic of Mali,The long title he has chosen for the Libyan revolution is designed to be an attack on that revolution and clearly puts him in the camp of the counter-revolutionaries. You might counter, "well, its true." I'd say yes, but as I have already said, I think "NATO backed" deserves a * due to the two-faced, back stabbing manner in which they "supported" the revolution. That aspect of the struggle isn't even on this writer's radar. He didn't bring NATO into the description to attack NATO, he brought NATO into the description, and spelled it out, to attack the revolution. I would also add that a great many international forces "backed" the anti-Qaddafi forces. One could just as correctly refer to Libya's Egyptian and Tunisian backed revolution, Libya's Anonymous and WikiLeaks backed revolution, and so on. The rest of the sentence is even more of a gem, because the writer, having already gone to considerable efforts to cast doubts on the Libya opposition's claims about the number of foreign mercenaries in Libya, seeks to blame the Libyans for what these mercenaries have done since they were forced out. Its like you got yourself out of an abusive relationship and now they are going to blame you for what your ex did to someone else after they left you. This week both the NY Times and the Washington Post have piled on with articles highlighting only negative results of the revolution. The lesson to the masses: Don't go there. On Monday, the Washington Post published a piece saying In Libya, Despot is gone but Chaos Reigns. In this, they focus on the struggle around Tripoli's trash problems. As usual, their main concern is the armed workers:At the entrance to Tripoli’s main landfill, Mustafa al-Sepany stands in combat fatigues, wearing an expression that says no trash trucks will get past him. For four months, none has, leaving the country’s capital city wallowing in uncollected garbage. Sepany is one of thousands of still-armed rebel fighters who ousted Libyan despot Moammar Gaddafi in last year’s bloody uprising. Now he is one of the residents near the landfill who are exercising their newfound freedoms by declaring they don’t want Tripoli’s trash. Anywhere but here, they say. And in post-revolution Libya, not-in-my-backyard fights come with automatic weapons.Clearly the WashPost is more comfortable with the usual situation were only the state has the firepower and they put the dump in whatever poor part of town suites them and the residents be damned. This is what Qaddafi did.The old landfill — built by Gaddafi 11 years ago — generated complaints among residents that it polluted waterways and bred disease. They are concerned that the military leaders are getting into politics:The militia leader from Zintan who controls the airport here in the capital has exchanged his uniform for a suit and tie and now talks about running for office — with his 1,200 armed men at his back. The head of Tripoli’s military council is starting a political party, and the military council in Benghazi is preparing its own slate of candidates for local office. The complaint about military leaders running for political office is certainly a strange one coming from an American source. Anyone remember Washington, Jackson, Grant, Eisenhower, even McCain's recent attempt? The survey reveals that Libyans expect to be increasingly confident about all four subject areas over time. While approximately 20 percent of respondents were confident or very confident at present, this rises to over 60 percent when asked about the next 12 months. Tripoli, April 1: The Libyan Ministry of Defense has announced more than eight thousand revolutionaries (thuwar) have been registered to be trained as border and vital strategic locations protection guards, These positive stories are coming out of Libya everyday but you won't hear about them from the MSM of the anti-interventionist turned counter-revolutionary because it doesn't fit their narrative. What would Karl Marx think? At a minimum, I should think that we can all agree on some basic facts about the Libyan situation: 1.) The old regime and organs of state power have been completely overthrown, including its armed forces. [unlike Tunisia & Egypt] 2.) The new state, i.e. the NTC is very weak and in its formative stages. [ it does not exercise a monopoly of violence] 3.) Large and diverse sections of the Libyan working class are well armed and organized into what they call 'revolutionary brigades'. This is already what I would call a revolutionary situation. Libya has, in fact, emerged as the leading edge of the historic social/political phenomenon we call the Arab Spring. It is the place where the struggle between the revolutionaries and the regime went over to armed struggle to the point of civil war first. It is the place where the old regime was defeated by a people's army and all the old institutions of state power have been completely abolished and must be recreated anew. I've already answered those, like Greenwald, that would give the military victory to NATO. They are just showing their cynical inclinations and lack of understanding of revolutionary war or war in general. Louis Proyect: The Unrepentant Marxist has just published an excellent piece on this question: Who made Libya’s revolution? Wars still aren't won from the air. If they were, then certainly the US would be ruling Vietnam today. Besides the NATO 'effort' in Libya was particularly pathetic. I don't believe they ever got above a 20%-50% dropped ordinance rate on what they euphemistically called "strike sorties", a fact never noted by the "left" sources that like to cite thousands of NATO "strike sorties" as "proof" that NATO was carpet bombing Libya. Could the Libyans have won without NATO support? I don't know. Could the Americans of 1776 have won without French support? I don't know. I refuse to play those games. History is what history is. NATO had its reasons for supporting the uprising against Mummar Qaddafi just as I'm sure the French had their reasons for supporting the American Revolution. 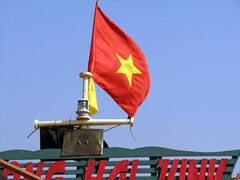 Ho Chi Minh accepted arms and training from the OSS. Revolutions require such "compromises" and they also require accepting support from non-revolutionary and even counter-revolutionary sources. Those that refuse such compromise "on principal" are dilettantes not revolutionaries. By now, it should be clear to all that the Libyan revolutionaries made a very wise compromise when they accepted NATO air cover, but refused NATO ground troops. NATO air support stopped Benghazi and Misrata from becoming scenes of mass murder like those we are presently witnessing in Homs and Idlib. Of course the dilettantes believe they should have gone it alone no matter how many Arab lives it would have cost, "if they were really serious", but then they didn't stand to lose anyone they loved in Benghazi. As far as the effects of the NATO air war on the civilian population of Libya is concerned, we now have some credible numbers and I feel entirely acquitted in my support for their intervention. The NYTimes was the first to publish in that area and they found that between 40 and 70 civilians had been killed by NATO. The UN did the most through report. They found 60 killed and 55 wounded. Most recently, Amnesty International claimed 55 civilians killed by NATO. These are incredibly low numbers for a war that took over 30,000 lives and in which NATO carried out more than nine thousand strike mission. Of course, anyone is free to challenge these figures. All they have to do is document some civilians killed by NATO bombs that are not covered by these reports. Then they can overthrow these reports and make news. And the Libyans did it with no NATO boots on the ground, in spite of NATO's best efforts to "at least" let them have Forward Air Controllers. They steadfastly refused. And there is a whole history of "friendly fire" incidents and NATO's withholding of support that the left should be writing about as far as NATO's true crimes are concerned. They won't do that because they don't even see that. Today's NY Times article ends on a ominous note that things will end up they same anyway, i.e. revolution is futile. Look for this to be quoted by the anti-interventionists:Former Qaddafi officials, who are also talking about forming a political party, say they hear an echo of the past. “They are speaking the same language we did,” said one former Qaddafi adviser, speaking on condition of anonymity for his safety. “We used force. They are using force. Nothing has changed but the flag and the national anthem.” Yes, political power till grows out of the barrow of a gun. That hasn't changed and that won't change. What has changed is which class holds the gun, and the proof of it is that former Qaddafi officials have the freedom to form a political party so soon after they spent 42 years denying that right to their fellow Libyans.